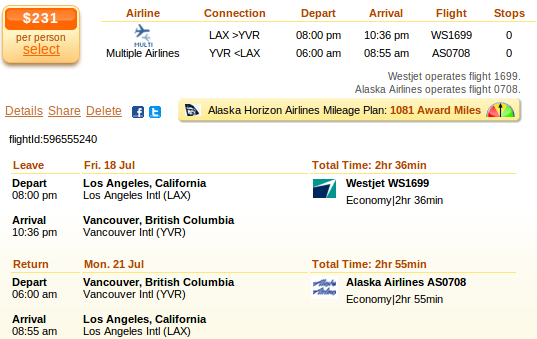 Our deal hunters now found you a great flight deal from Los Angeles to Vancouver for $231 round-trip, including taxes. Book now and fly in July with a multiple airlines flight jointly operated by Westjet and Alaska Airlines. We have found this Vancouver flight deal on Faregeek while searching on Travelgrove, so that is where you should look as well. Just to make sure that you are booking the cheapest airline ticket, compere the rates of some other merchants also and book the lowest fare! Leave from Los Angeles International Airport (IATA code: LAX) to Vancouver International Airport (YVR) on July 18 and return on July 21. The flight is non-stop each way, the departing one is being 2 hours 36 minutes while the return 2 hours 55 minutes long. You will get 1 award point from Westjet Frequent Guest Program (the equivalent of $1) and 1,081 award miles from Alaska Horizon Airlines Mileage Plan (about 5% of a free US domestic flight). The airfare operated by Westjet and Alaska Airlines together only costs $231 r/t. The next best offer is from Air Canada, it costs $259 r/t, nearly $30 less, which – on such a short haul flight – is a considerable saving. Find the rates of the top 5 cheapest airlines for this route in the table and decide whom you want to travel with. This entry was posted on Monday, May 5th, 2014 at 9:53 am and is filed under Airfare Deals. You can follow any responses to this entry through the RSS 2.0 feed. You can leave a response, or trackback from your own site.